A new feature introduced with SCCM 1606 was being able to modify the boot times for PXE. This is done by modifying the TFTP block and window size of the boot image RamDisk. This was originally implemented to help a admin over come network requirement. This allows us to make the PXE boot times much faster for my self this meant taking a 10 minute boot time all the way down to 30 second boot time. In order to make this change you need to create 2 registry keys on your PXE enabled DP. The default value is 4096 (4k). once you have added the registry keys you will need to restart the Windows Deployment Service for the changes to take affect. 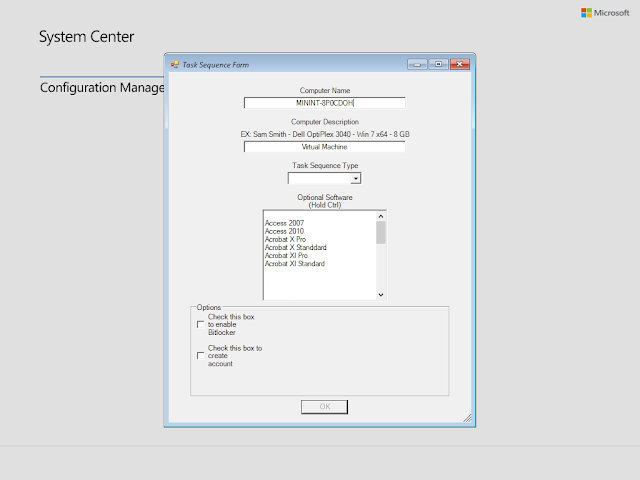 I have just completed a new tool to add to my tool box, SCCM Tools. SCCM Tools is a single executable that can help me to gather some information about a SCCM site or do some basic administration tasks. The tool is portable can be ran from a flash drive or a network location. To use the tool launch the exe file with an account that has access to the sit. Then you will be shown a page that where you can type the site information. If you have the SCCM console installed on the computer you are running the tool from you can check the box to the right of the Site Code. Other wise the tool will use the resources needed from the Site Server. Once you connect to a site you will be presented with the Read Me landing page. This page simply tells you what you can do with the tool. Notice the black bar at the bottom of the tool will tell you the status of the action you performed, letting you know when it is safe to perform your next task. Before I have posted how you can create a TS for windows 10, add a GUI to your TS and run a script to configure your windows 10 install. However all of this has become out dated and so I wanted to update all of that. 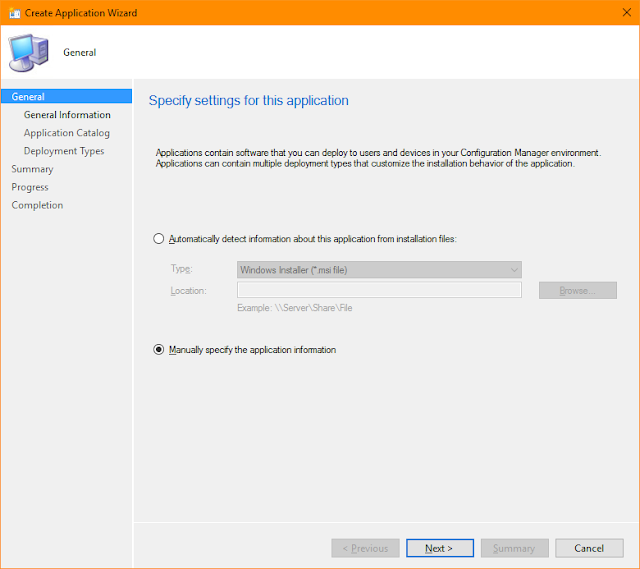 This how to will walk you through how to create a TS that will allow you to choose a windows 10 or windows 7 image, name the computer, add the computer description to AD, Choose form a list what applications you want to install, Choose to enable BitLocker and set the PIN as well as create a local account. 2. 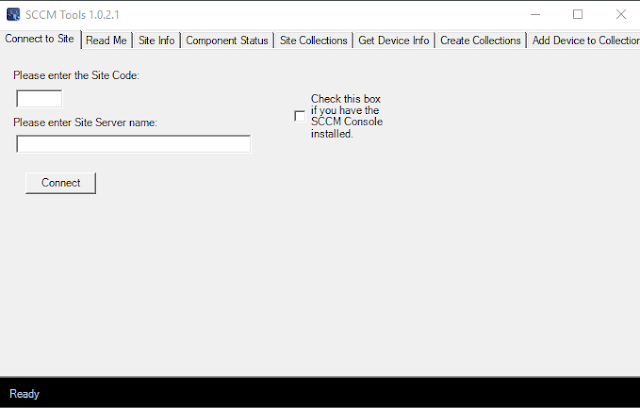 If you have not already done so download and install MDT on your SCCM site server. Office 365 by its self is a fairly easy Application to deploy but it can get complicated when you need to remove other Office products or install different versions of Office 365 based on what was installed on the target device. That all being said I wanted to create a reference for getting all the tools that make office deployments easy and throw in a few tips to solve some more unique issues you may have with deploying Office 365. 1. The first thing you want to do is download the Office Deployment Tool. Once you install the Tool you will find a setup.exe file and a configuration.xml.